"'Youth will have its fling'"
will entertain us with a concert. David Goulden with his students - Charlie, Mya, Chloe, Lewis and Kia. A generous audience gathered to launch the 2018/19 season of events at Cross Street. 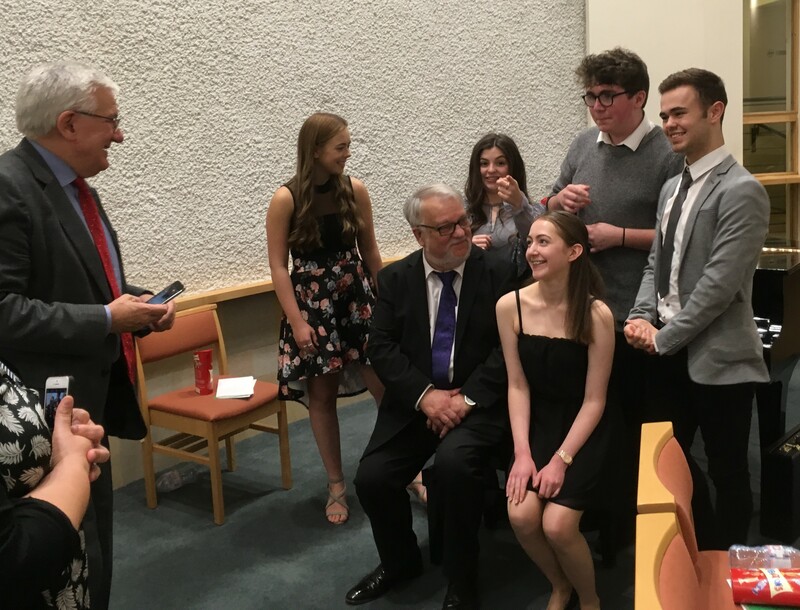 We heard an excellent talk and concert by David Goulden and five of his music and drama students drawn from All Saints Catholic High School in Kirkby and Sale Grammar School. The ages of the singers ranged from 13 to 18 and their songs were taken from four of the Savoy Operas, along with Sullivan's "Orpheus With His Lute" plus six items from the wider musical theatre repertoire. Early nerves soon settled and a very enthusiastic audience enjoyed a memorable concert. It was heartening to hear G&S performed by young and eager voices - two sopranos, one mezzo, a tenor and baritone. David accompanied at the piano. The songs were linked by astute and thought-provoking observations from David, exploring why G&S is not performed in schools as often as we should like and how this could be remedied, including forging links between schools and local amateur performing societies. David's main thrust was that G&S is a fun activity and that young people always respond to that. The concert certainly proved that. Many thanks to David and his teaching colleagues, both schools and the students; Chloe, Charlie, Mya, Kia and Lewis for an entertaining and enjoyable evening.